« BibleNewsProphecy: Might the Great Tribulation start in 2019? THE end of the world could be just over a month away if biblical conspiracy theorists are correct about the Blood Moon prophecy. A doomsday preacher has now warned there is nothing to say the world will not end on January 22. The Blood Moon prophecy claims the world’s fiery demise will be preceded by a menacing omen in the skies. Doom-mongers and online conspiracists believe the upcoming January 21 Super Blood Moon is such an omen. On the night of the Blood Moon, the glowing disc of the lunar orb will take on a deep red, almost blood-like, hue. 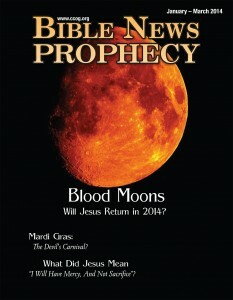 Pastor Paul Begley, an evangelical preacher from Indiana, US, is one of the many doomsday prophets who believe the Blood Moon is a warning of the apocalypse. In his opinion, the “heavens are already shaking” and the “coming of the Lord” is fast approaching. No, it is not possible that the world will end in 2019 or that January 21 blood moon is more than a natural phenomena. The scriptures Paul Begley referred to are NOT fulfilled until well AFTER the start of the Great Tribulation. To see if that is possible in 2019, check out the video: Might the Great Tribulation start in 2019? Years ago, I denounced the view that the ‘blood moons’ of 2014 and 2015 could mean that Jesus would return or that the ‘Day of the Lord’ was about to start. This was something that Mark Biltz (who practices Messianic Judaism) started promoting back in 2008–but he was wrong. I also denounced the super blood moon prophetic nonsense in 2018 and am also now denouncing the super blood moon prophetic nonsense for 2019. Once again, Mark Biltz and WND were promoting blood moon nonsense. God was NOT sending some special message with a recurring natural phenomena. Mark Biltz and WND promoted falsehoods related to the eclipse of August 21, 2017 (see ‘Blood moon’ Mark Biltz claims massive eclipse a sign of God and Mark Biltz on the approaching Asteroid Apophis and the August 21, 2017 solar eclipse). As far as prophecies and Donald Trump’s presidency goes, here is a link to our latest video which shows world events have been confirming at least 18 things I wrote about based upon my knowledge of biblical prophecies and geopolitics: Donald Trump’s Prophetic Presidency. Both Mark Biltz and WND’s founder Joseph Farah consider themselves to be ‘Messianic Jews.’ While this means that they will avoid biblically unclean meats, keep the Sabbath, observe the biblical holy days, and hold to parts of a few Church of God doctrines, the Messianics are NOT Church of God Christians (see also Messianic Judaism Beliefs Differ from the Continuing Church of God). Like the Seventh-day Adventists, they are basically a type of Protestant. WND promotes him, but Mark Biltz has been wrong. He misled many about the “blood moons” a couple of years ago (see also WND continues to promote Mark Biltz’ blood moon nonsense) and about the 2017 solar eclipse being a sign from God. Pastor Paul Begley is trying to tell people to be in awe of something that does not have prophetic significance. Do not be like the pagans and read things into astronomical phenomena that people like Mark Biltz and Paul Begley have been pushing. How people like them twist scriptures (cf. 2 Peter 3:16) and connect things while overlooking what the Bible teaches reminds me a lot of the late Harold Camping, whose detailed calculations and predictions were later proven wrong (see Harold Camping’s Teachings About the End of the World Do Not Agree with the Bible). So, before the next ‘super blood moon occurs, I again want to inform people that this eclipse is a natural phenomenon and not anything that is a direct message from God. Thus, you can be certain that the upcoming ‘super blood moon’ is not a message from God next month. Blood Moons, Eclipses, and Prophecy There were four ‘blood moons’ expected in 2014 and 2015. Some claimed that they signaled the Day of the Lord or the return of Jesus Christ. I denounced that view in advance. Some later pointed to a solar eclipse in 2017–is that a ‘sign from God’? What about the ‘Super Blood Moon’ of 2018? A YouTube video is also available: Blood Moons, Prophecy, 2014, and 2015. This entry was posted on Sunday, December 9th, 2018 at 8:40 am	and is filed under Prophecy.